Within this post, you’ll find the top free resources I use to organize and plan women’s retreats. I’d love to hear from you and the free resources you use. Please tell me in the comment section at the end of this post. Have fun planning! When your ministry event budget is little to none, finding free resources to help organize and plan is such a blessing. 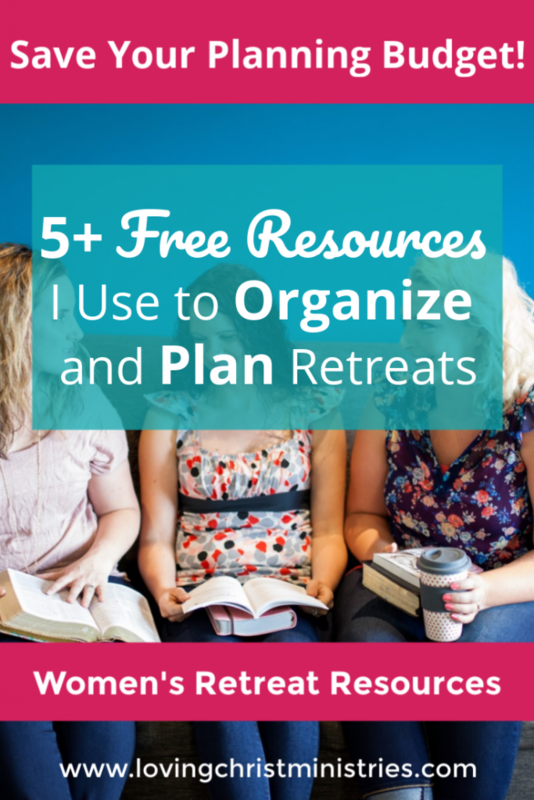 In 2012, when I began planning our first retreat with my co-planner Brooke, we looked everywhere for free resources because we had nothing to spend. Fortunately, I knew of several free online programs that would help us take shareable notes, organize supplies and teams, and manage the steps we needed to take in order to plan. I’m sharing these resources with you in the hopes I can save you some time by keeping you from having to search and search. Quality, free resources will help you plan and organize no matter your budget. Even if you do have money to spend, it’s nice to be able to use it for other things like decorations, door prizes, and other fun items. These five free resources for retreat planning have come in handy over and over. Most of these resources are online and one isn’t. I’ve found value in them all and think you will too. 1. Google Apps -this resource actually includes many as they all fall under the Google umbrella, but I’m going to mention each and share how I use them. All you need to use them is a free Google account. Sheets – I use Google Sheets to organize supplies needed, keep track of registrants information, and keep track of expenses. Forms – Google Forms works perfectly to collect online registrations and to gather feedback after the retreat. Keep – Keep is a wonderful checklist making program. I like it best for to do lists or anything else I want to check off items quickly as I go. Just like with the other Google Apps I’ve mentioned, Keep lists can be shared with others do they can add items as needed. 2. Trello – Trello works perfectly to keep track of your retreat planning teams. While there is a paid version of Trello, the free version is sufficient for what I use it for. Sign up for my newsletter and for the 10 Initial Steps checklist, and you’ll get a customizable Trello Team Planning Board as an extra freebie. 3. Women’s Ministry Toolbox – This site has many ideas for ministry events plus lots of extra encouragement you will certainly need throughout your retreat planning. 4. Christian Camp Pro – While this site has resources for more than women’s ministry, they do have many great event ideas plus resources specific for women’s retreats. I think it’s a great site to gather ideas. 5. Your Church – I know it sounds funny to list your church as a resource, but this is where you’ll find the most valuable resources. The women in your church will be the quickest to join your planning teams which will make the entire process easier. Church members often are willing to pray for your retreat, plus they may donate funds or supplies which will keep your budget under control. Most of the time, your church can act as a free venue for your retreat which again saves your retreat team money. Being in charge of planning can seem overwhelming at times, but please don’t let that hold you back from following God’s call to lead. Pray, plan your teams, and check here to find the free resources you need.